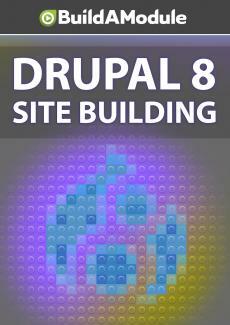 Credits for "Drupal 8 Site Building"
Congratulations! That was a lot of material and I hope you're feeling empowered and excited. This video was lovingly crafted to help you celebrate your accomplishments. Enjoy. Okay, one last visit to the Quizatron. ♫ Quizatron 9000 ♫ Question one. What are some good ways to celebrate your newly acquired skills? Check all that apply. A, pool party, B, nap, and C, build something awesome. And the answer is all of the above. Question two. After you've celebrated, you could celebrate some more. True or false? The answer, true. And question three, what's the punchline to that panda joke? A, "They were out of bamboo. "It's that black and white. " B, "They decided to enforce their heretofore "disregarded restrictions on cuteness. " Or C, "Because they tend to create a pandemonium.
" The answer is none of the above. To fully appreciate the punch line, you have to hear the whole joke. So here it is. A panda walks into a restaurant and is seated and brought a menu. The waiter comes, takes the panda's order. The panda is very polite. But when the waiter brings the check, the panda pulls out a gun, shoots him in the chest, gets up and walks out of the restaurant. One of the other waiters goes to the manager and says, "What the heck just happened?" And the manager said, "Well, I don't know a lot about pandas. "Let's look it up.
" So he pulls out his phone and starts reading and says, "Ah, right here. "It says, 'Pandas eats, shoots and leaves. '" And let's spin up the Overachieverator one last time.